Hiperbaric will attend several events in February to meet with clients and users of HPP technology. In February, you will find us at Fruit Logistica (Berlin – Germany), Gulfood (Dubai – United Arab Emirates) and Expo Carnes y Lácteos (Monterrey – Mexico). At Hiperbaric we like to be informed about the latest developments and market trends. This helps us to be able to advise our customers about their processes and products. Fast and personalized attention 24/7 from the first moment and for any eventuality. Between February 6 and 8 you can find our sales team and technicians at Fruit Logistica. It is of the most important fresh fruit and vegetable trade shows in the world. HPP technology has been gaining prominence in recent years, due to the benefits it brings to vegetable products. Specially Avocado based products. With 25 years of experience, this trade show is hosted every year in Berlin with more than 78,000 visitors from 130 countries. Everyone eager to see the innovations presented by the nearly 3,300 exhibitors who attend. From global players, to small-medium-sized companies and organizations around the world, you can find here the main players in the fresh produce sector. Do not forget to check the stats of the latest edition edition because it is a date that you can not miss. If you want information, advice or just a meeting to get to know us, do not hesitate to contact us. This international fair that will be held from February 17 to 21 at the prestigious World Trade Center in Dubai, will also feature the presence of Hiperbaric. Gulfood, with its 1,000,000 square meters of exhibition space, is the world’s largest annual trade show for food and beverages. It brings together more than 98,000 visitors from 193 countries and more than 5,000 exhibitors from 8 food sectors. Beverages, dairy products, oils, wellness products, meat, cereals, prestigious brands and global food. It is not only a meeting point for the main food industries and machinery manufacturers of the world, it is also an unparalleled sample of the world’s gastronomic wealth. In its exhibition section, it has master chefs and food producers of recognized prestige that will delight the attendees. If you want to be up to date on the latest trends in the market, do not miss this appointment and contact us; we will be happy to assist you. 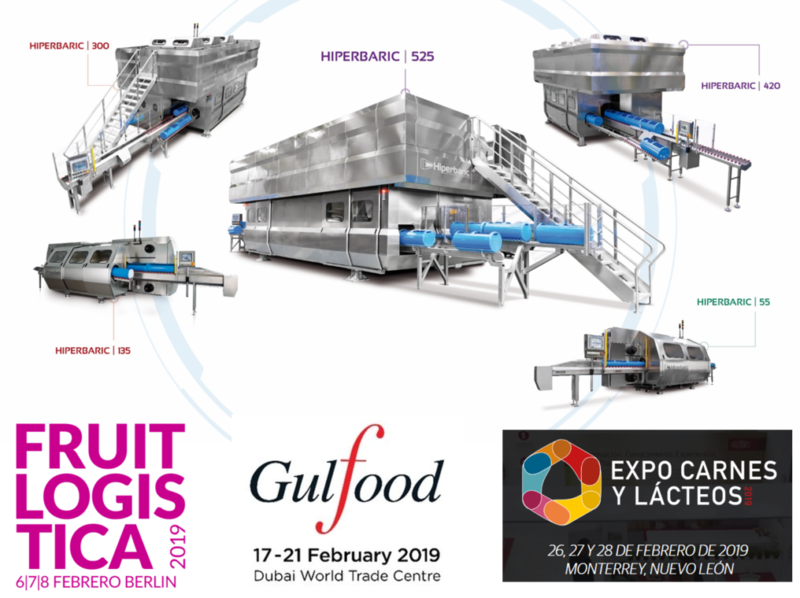 From February 26 to 28, Hiperbaric will attend the most important meat and dairy industry event in Latin America, the Expo Carnes y Lácteos. We must not forget that Hiperbaric installed its first machine almost 20 years ago in a large meat company, Campofrío. Now with over 280 machines installed worldwide about 28% is dedicated for the meat industry. Our experience and knowledge in the application of HPP technology for meat products is extensive and we have many technical articles about it in our blog. With more than 350 exhibitors and a very ambitious technical program, it is expected that more than 6,500 visitors with very different profiles will visit the event.